At supper with his friends, Jesus was troubled in spirit, and declared, "Very truly, I tell you, one of you will betray me." The disciples looked at one another, uncertain of whom he was speaking. One of his disciples-- the one whom Jesus loved-- was reclining next to him; Simon Peter therefore motioned to him to ask Jesus of whom he was speaking. So while reclining next to Jesus, he asked him, "Lord, who is it?" Jesus answered, "It is the one to whom I give this piece of bread when I have dipped it in the dish." So when he had dipped the piece of bread, he gave it to Judas son of Simon Iscariot. After he received the piece of bread, Satan entered into him. Jesus said to him, "Do quickly what you are going to do." Now no one at the table knew why he said this to him. Some thought that, because Judas had the common purse, Jesus was telling him, "Buy what we need for the festival"; or, that he should give something to the poor. So, after receiving the piece of bread, he immediately went out. And it was night. Another Passover was upon Jews and like so many of our holiday dinners, things may have become a little mechanical for some of those gathered in that upper room. The wine, the unleavened bread, the bitter herbs; all part and parcel of a meal recalling an event that took place beyond anyone's memory.This passover would be like none other since that first one celebrated in Goshen. St. John paints an interesting picture of the unfolding betrayal. 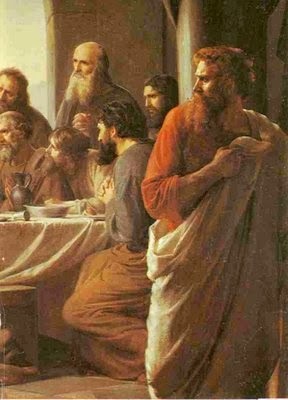 Of the eleven faithful disciples, only St. Peter and the evangelist are initially aware of that Judas, son of Simon Iscariot, is about to betray the Master. In fact, the remaining nine seem to thing that the Teacher has sent their brother out to provide for those in need on this feast night. No, this was hardly the case. Judas, according to Matthew's account, had in fact already agreed to throw the master to his enemies and was paid well for the deed. Now, he simply had to work out the logistics of making sure that Caiaphas's temple guard would make it to the garden in time to apprehend the Christ. There are volumes of apologetics in print, giving an explanation for WHY Judas betrayed The Christ. These range anywhere from pious conjecture to pure puffery. The WHY will be revealed on that great and terrible day when all will stand before the Father and all things will be made known (A day that each of us, if we're honest with ourselves, fear to some degree or other). Judas should be a cautionary tale for us all. Though he was one of the twelve who proclaimed the good news, drove out demons, and healed the sick, he was also known to be a thief. This "power evangelist" was now twisted in to the traitor of all time. The enemy of our soul is highly adept at leveraging "character flaws" (what was once commonly called sin) in our lives, and enticing us to do deeds beyond darkness. "Respectable little murder's pay, they get more respectable everyday..."
We are all capable of becoming that "Man from Kerioth". May each of our heart's be guarded, today and always. Thank you so much for this post. You brought up some very good points. You are so right that we are all capable of becoming that "Man from Kerioth" - May we be "kept by the power of God through faith" and as we cry out, "Teach me, O LORD, the way of Your statues, and I shall keep it to the end." - may we hasten to the throne of God in much-prayer.